Regarded as a Condé Nast Readers' Choice and Gold List hotel, and honoured with the Travel + Leisure distinction as a top Canadian hotel, the Fairmont Empress graces Victoria's sparkling Inner Harbour with an iconic presence. This luxury hotel in Victoria, British Columbia, offers 464 beautifully appointed guest rooms and suites, and expansive meeting and wedding space adjacent to the conference centre. Located on the picturesque West Coast of Canada, this is the ideal location to explore all the natural beauty of Vancouver Island. Discount: The Clipper has provided a 10% discount for PNWER attendees for travel between November 1 - 10. If you prefer to make reservation by phone, please call 206-448-5000 and mention PNWER to receive the discount. If you need to bring your car, consider driving north of Seattle and catching a ferry from Anacortes to Sidney, B.C (20 minutes from Victoria). Ferries leave twice a day. Details: Leaving from Port Angeles, The Coho ferry operates only out of Port Angeles. Cost:​ Depends on location and time but around $300.00 round trip. 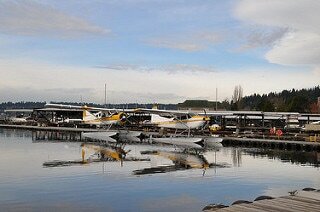 Details: Catch a Seaplane in Seattle from South Lake Union, Lake Washington, or Sea-Tac to Inner Harbor/Victoria and back.